Red Bulls 1 Union 0: We're In! An unlikely first half header from Dane Richards that hit a goalpost before ricocheting off Faryd Mongradon's back and into the Philadelphia Union goal was, in the end, all the New York Red Bulls needed on Thursday night to punch their ticket to the 2011 MLS postseason. The final scoreline could have been even more lopsided, if not for some poor finishing and a few key saves by Mondragon. In the first half in particular the Red Bulls controlled the tempo magnificently, allowing the Union few chances if any. When the second half began, Piotr Nowak made it clear immediately that he wanted to get a result that would allow his team to avoid the wild card round, by bringing on Freddy Adu and Danny Mwanga to get after the Red Bulls back line. Later, he would ratchet the pressure up even further when he introduced youngster Roger Torres, whose goal had earned Philadelphia a victory at PPL Park earlier in the season. To the Red Bulls' credit, however, they stuck to their task, worked tirelessly for each other and showed a degree of grit and determination that fans have seen all too infrequently this season. Stephen Keel and Tim Ream had occasional sloppy moments, but only allowed Philly a single shot on goal all night. Jan Gunnar Solli had one of his better games on the right, providing the crucial cross for Richards and making a number of other forays down his side, while working hard defensively. Roy Miller and Dax McCarty had two of their stronger games of the season, while the "mighty mites" striking team of Luke Rodgers and Dane Richards kept the Union defenders on their heels all night. All of this was accomplished without the help of Thierry Henry, who was serving a one match suspension for his red card in Kansas City last Saturday. Despite his attractive MVP credentials and point-saving heroics, it may be fair to say that the Red Bulls play with better movement and a greater sense of purpose when Henry is not in the lineup. Is it a case of players waiting around for their superstar to do something magical? Perhaps. Whatever the case may be, they'll need to bring the same commitment they showed last night to their first round playoff game, when Henry will undoubtably be back in the starting XI. 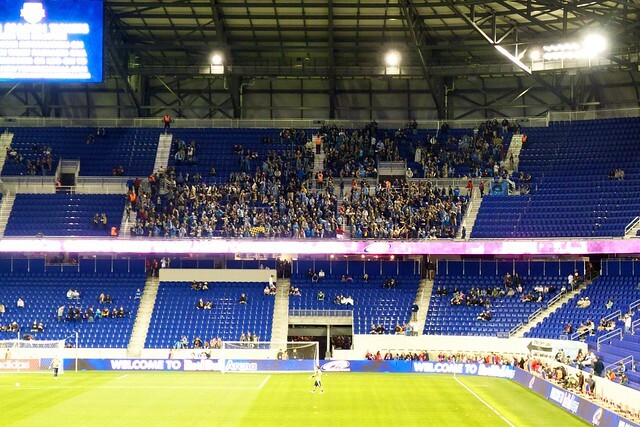 Credit to the Philadelphia Union supporters for bringing the largest ever traveling contingent to Red Bull Arena. Their presence helped create a fantastic atmosphere and raised the intensity of the South Ward as well. It would have been nice to see the Red Bulls' supporters groups get to the Arena a little earlier, rather than letting Philadelphia fans have the Freedom of Harrison for an hour before kickoff, but when there is beer to be drunk I suppose that takes precedence. Sebastian Le Toux is lucky not to be facing a red card suspension. During the first half, frustrated with some of the Red Bulls' physical play, the Frenchman shoved referee Mark Geiger with both hands, using some force. Not only did Le Toux not receive a red card - he didn't get any card at all. When you see Thierry Henry sent off twice with questionable red cards, but Le Toux let off for shoving an official, you have to wonder what is going on at MLS headquarters. Le Toux and his Philadelphia teammates claimed after the match that they were robbed of a legitimate goal in the second half when the play was whistled for offside. Leaving aside the fact that Le Toux should have been changing into street clothes by then, the correct call was made. Hans Backe's substitution policy remains a real head scratcher. With Philadelphia throwing on one fresh body after another, Backe stuck to his guns and did not make a single substitution until second half injury time. It's pretty apparent that - rightly or wrongly - Backe has no faith whatsoever in his bench. However the postseason shakes out, New York desperately needs to add depth for 2012 so that Backe doesn't continue to run his starters into the ground. So - what's next? The RBNY victory ended the playoff hopes of the only two teams that had a chance of sneaking into a wild card spot, Portland Timbers and Chicago Fire. Results this weekend will determine who the Red Bulls will now face in the wild card match, with FC Dallas, Real Salt Lake and Colorado Rapids all still possibilities. Whoever New York ends up playing, under the new playoff format they will need to win away from home in order to move on to a second leg home/away series.